This chemistry dictionary offers the chemistry definitions starting with the letter Z. These glossary terms are commonly used in chemistry and chemical engineering. Click the letter below to find the terms and definitions beginning with that letter. 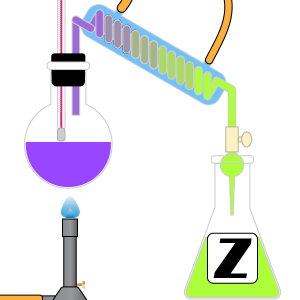 Z (zusammen) – Z or Zusammen is a notation for a stereochemical arrangement where all of the higher-ranking substituent groups are located on the same side of the double bond. Zaitsev rule – The Zaitsev rule is an organic chemistry rule which governs which alkene will be the major product of an elimination reaction. The favored product will be the alkene with the most substituted alkene. For example, if the reaction involves breaking a C-H bond, the preferred -H bond will come from a CH2 before a CH3 group. Zeeman Effect – The Zeeman Effect describes the splitting of a spectral line into two or more spectral lines in the presence of an external, static magnetic field. zeolite – Zeolites are a type of silicate mineral. Zeolites are often used to soften water by cation exchange. zepto – Zepto is the prefix associated with x10-21 and is denoted by the symbol z.
zeta potential (ζ-potential) – The zeta potential (ζ-potential) is the potential difference across phase boundaries between solids and liquids. In colloids, zeta potential is the electric potential difference across the ionic layer around a charged colloid ion. Typically, the higher the zeta-potential, the more stable the colloid. When the zeta-potential equals zero, the colloid will precipitate into a solid. zetta – Zetta is the prefix associated with x1021 and is denoted by the symbol Z.
zero order reaction – A Zero Order reaction is a reaction whose rate is independent of the concentration of reactants. zero-point energy Zero-point energy is the lowest possible energy level of a quantum mechanical system. Ziegler-Natta catalyst A Ziegler-Natta catalyst is a catalyst used to initiate the synthesis of 1-alkene or α-olefin polymers. zinc – Zinc is the name for the element with atomic number 30 and is represented by the symbol Zn. It is a member of the transition metals group. zincography – Zincography is a method of etching zinc plates with a strong acid to produce a printing plate. zirconium – Zirconium is the name for the element with atomic number 40 and is represented by the symbol Zr. It is a member of the transition metals group. zone refining – Zone refining is a method of purifying solids based on the tendency of solutes to concentrate in the liquid portion of a solution as it is frozen. A bar of solid material is drawn across a heat source such that only a narrow zone is melted st any given time. As the heat travels down to the end of the bar, impurities become concentrated along the band, eventually carried to the end and removed. zwitterion – Zwitterion is the dipolar form of an amino acid which occurs when H+ ion is transferred from an acid group to an amine group. zymase – Zymase is a collection of enzymes that function as a catalyst during the process of fermentation of sugar into ethanol and carbon dioxide. zymogen – Zymogen is a type of protein that can be biochemically transformed within an organism into an enzyme. Zymogens typically transform into enzymes that catalyze processes that break down other proteins. zymurgy – Zymurgy is the study of the process of fermentation. Louis Pasteur is considered the first zymurgist when he studied the fermentation of sugar into alcohol with yeast.